The Spohrs Are Multiplying I ate my deodorant. This morning I had a banana for breakfast. About 20 minutes later I was at the bathroom mirror and I noticed a chunk of white on the collar of my shirt. Looking at my reflection, I picked the chunk off my shirt and put it in my mouth…and realized the white gob wasn’t banana, but deodorant. Expecting something delicious and getting something toxic. That about sums up my day. Today the residents came out in droves, eager to explain the conclusions they had come to with the pulmonologist. The first thing that was determined is Maddie is too small for a bronchoscopy. Her little windpipe and lungs just won’t accommodate the bronchoscope. I’m glad that was decided BEFORE they tried to give her one. Because of this, a bunch of treatments were prescribed today. The latest x-ray showed no improvement, with some “areas of interest” in her left lung. The antibiotic azithromycin was prescribed to combat possible pneumonia. The x-ray also showed that her mucus plugs are moving throughout her lungs, causing new areas of collapse. They also want to make sure she doesn’t spit up and inhale it, so she has been started on reglan and protonix again. Tomorrow, if the next x-ray shows no improvement after 24 hours of antibiotics, she will be transferred to the Westwood hospital, where she will be sedated and undergo an invasive suctioning procedure on her lungs. And the pulmonologist wants to test her for cystic fibrosis. I’m sick of going in circles about CF. She had the newborn screen and genetic testing in the NICU, and I was tested for the gene when I was pregnant. Everything came back negative. Now the pulmonologist wants to do a sweat test. I thought we were done with this but we keep getting sucked back in. How many tests have to be done before we can put this to bed, one way or the other? When I was first put on bed rest I would send out emails all the time about my latest progress. But then when I would think about it (and you have plenty of time to think when you’re on bed rest), I felt like I was hassling people with my problems. So I slowly stopped sending them. Last time Maddie was hospitalized I sent a text message to a few people, and this time I didn’t do anything. Everyone has their own problems so why should I force them to think about mine? I don’t want anyone to be put in the position where they feel like their problems aren’t as bad as my problems. It isn’t a contest, you know? But people can’t help but compare. I know someone who was recently diagnosed with cancer. We were talking about her chemo and everything she’s going through, and then she said, “well, your baby is in the hospital, that’s harder.” I didn’t even know what to say at first, I couldn’t believe she was discounting her own feelings and experiences WITH CANCER. People always say, “it could be worse,” and while of course it’s true and appropriate to have perspective, those words shouldn’t rob us of the feelings we are having at the time. But they do. I’m passing the conch now. *sigh* I don’t really know what to say. I’m sorry she’s not hope and not progressing. I really hope she wont be transferred and have to have that suction thing. I hear you on the last portion of your post. Well you have people here that are genuinely interested in Maddie and your family, and we are praying for your struggles each day. So, tell it to us! We’re listening. H- it is totally fine to vent. You need to. Maddie will be fine, it will just take a little time. She is a fighter and a fire cracker! I know that your posts have kept me sane! I love you and Mike and Maddie – you could never be a burden. 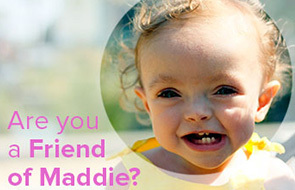 Oh, and you’re HUMAN, and you’re been a hell of a lot more positive that I think I would have been Hang in there – we’ll walk up a storm for Maddie tomorrow! I am a big HATER of the words “it could be worse.” Well, even if you’re dead – it could be worse.. you could be watching your children being tortured or some UnGODLY horror.. it can ALWAYS be worse.. but that doesn’t make anyone’s anything any less WHATEVER. seriously. I’m so sorry – and if you’re going to eat your deodorant you really need to switch to the coconut organic LUSH stuff I use.. it’s really yummy. You feel how you need to feel. HUGS. Oh yuck. Sending lots of good thoughts across the country and time zones to you. My husband and I check on you often. I think you’re handling yourself with a huge amount of grace and dignity, when you really just want to scream. I think I’d be screaming. Keep us posted on the transfer!